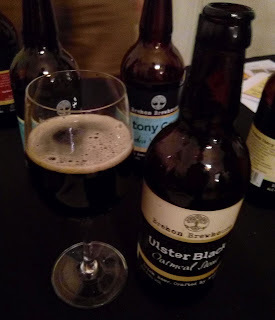 It's St Patrick's Day today, and while I don't especially approve of either cruelty to snakes, or evangelism, it seems an appropriate opportunity to write about Irish beer – and especially about the Irish beer that doesn't come from a huge and shiny brewery near the banks of the Liffey. 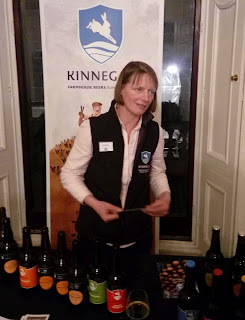 And yet, when I was invited to this year's Spirit of Sharing showcase of crafted Irish drinks at the Republic's embassy in London, the thing that struck me was that this time the brewers were just a small minority – just three of them*, far outnumbered by producers of spirits. It felt like a big change from last year, when microbreweries were the dominant presence. Interestingly, although the breweries taking part were outnumbered they had pride of place, being the first things visitors saw as they entered the event. I was delighted to see Metalman Brewing there – it’s one of Ireland’s oldest new-wave micros, having celebrated its sixth anniversary in production earlier this month – and to finally get a chance to chat in person with brewer and co-founder Gráinne Walsh. We’d spoken on the phone a couple of years ago when I was writing about microcanning, which Metalman was also the first in Ireland to adopt. Part of this expansion is down to a bigger brewkit, which they finally got up and running about 18 months ago. The problem for Irish craft brewers, and the reason some are looking to the export market, is that the growth in domestic demand isn’t keeping up with the growth in supply – and there are still new contract brands and new breweries setting up, says Gráinne. That’s not too bad for her company – she notes that they didn’t expand the brewhouse so that they could scale their production linearly, instead it was because they were having to brew way too often and inefficiently on the old kit. As well as the pale ale, she’d brought along their spiced wheat lager Equinox, which is a tasty refreshing brew, dry-sweet with lightly citrus notes, plus two of the current seasonals, Ginger and Sgt Pepper. Ginger does what it says on the tin – a warming ginger note over a slightly dusty blond ale – while Sgt Pepper is a lightly funky farmhouse Saison with well judged notes of sage and white pepper. Their bottled beers are all unfiltered, unpasteurised and naturally carbonated, although Libby says they’re not bottle-conditioned as such. “We do have draught lines as well,” she adds, “but it’s difficult because you have to keep that line supplied – with the same beer, too! We’re lucky in a way that we started with packaged beer.” Of those I tried, the regulars were all good, as long as you don’t mind a slight haze. 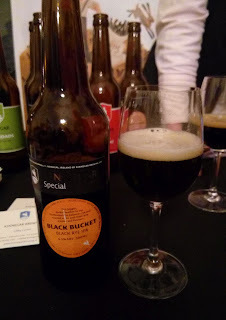 The standouts were all from the specials range, though, especially the peppery and spicy-fruity Swingletree, which is a strong Saison, a rich foreign stout called Flying Saucer, and my personal favourite, Black Bucket, a beautifully complex black rye IPA. Although they’re waiting for the new brewhouse for their main export push, which will feature 330ml bottles replacing the current 500mls, you can find Kinnegar beers on tap all over the UK this weekend as they’re St Patrick’s Day guests in the Brewdog bars, the Rake, the Tate Modern bar, and several others – see their blog for a list. Last but far from least was Brehon Brewhouse – Seamus McMahon reckons he is the only dairy farmer in the country who also has a brewery on his farm. He says he’s into brewing partly to boost the local economy – the brewery employs five people and uses locally grown malt too, while the waste can go for animal feed. “We’ve doubled the size of the brewery since we set up in 2014, and will double again this year,” he says, adding that he’s in 50 pubs around the area as well as several supermarket groups. He has a fairly typical range for an Irish micro – a blonde ale, a red, an IPA and slightly unusually, both a porter and a stout, though he didn’t have the porter with him. The ones I tried were all good examples of their styles, with the Ulster Black Oatmeal Stout standing out as very pleasant and quaffable. What’s an Ulster beer doing at the Irish Embassy, you ask? Well, the historical Ulster is nine counties, only six of which are now part of the UK. Both Brehon and Kinnegar are therefore technically Ulster breweries, even though they’re in the Republic. As I said, it was however spirits that dominated – mostly whiskey of course, but also poitín (aka potcheen, which is basically unaged whiskey), plus 'craft' vodka and gin. Irish whiskey’s presence you’d understand – it’s reportedly the fastest growing spirit in the world – but vodka and gin? Not only are they currently hip, especially gin, but they don't need time, unlike Irish whiskey which by law must be matured at least three years before it can be sold. So if you are starting a distillery, white spirits are good to get you going while you wait for your whiskey to come of age. One change from last year was that more of the spirits producers seemed to actually be distilling now, although as most only set up their stills within the last two years, few had their own whiskey yet. Instead, they typically get started by buying already-aged whiskey in bulk, then ageing it some more and blending it for resale. The other was just how many new faces there were. Most of the participants – and all the breweries – were new from last year. This may be deliberate by the organisers at Bord Bia (the Irish Food Board), as the event's role is as a venue for producers who're not yet exporting to the UK. All in all, an excellent event by Bord Bia: my thanks go to them, and of course to the ambassador Dan Mulhall, for being such good hosts. *Well, three and a half – Dingle Distillery, which was there with its whiskeys, is an offshoot of the Porterhouse brewery and pub group, so it had some Porterhouse bottles on its embassy table. This is also why the London Porterhouse this week was advertising a Dingle whiskey tasting.